We’re all familiar with this feeling: Find something you love on Instagram and immediately want to purchase it without thinking. While you may not regret an impulse purchase that’s under $25 or $50, something a bit more expensive could result in remorse (you know, when you get that credit card bill back). But, if you avoid a rash shopping decision and instead save strategically for a short period of time, that must-have item could be in your hands in no time. When it comes to the It bags of the season, one style that reigns supreme is the Staud Grace tote. Seriously—scroll through the IG feeds of the fashion elite and you're bound to spot the adorable slouchy bucket bag in either pretty satin or cool patent. The perfect companion to a going-out outfit or an off-duty look, this is the one bag you'll use all fall long. While it rings in around $250 to $275, it can actually be yours for $5 a day if you commit to a plan of putting that much away (i.e., as much as your morning latte) for just 55 days. 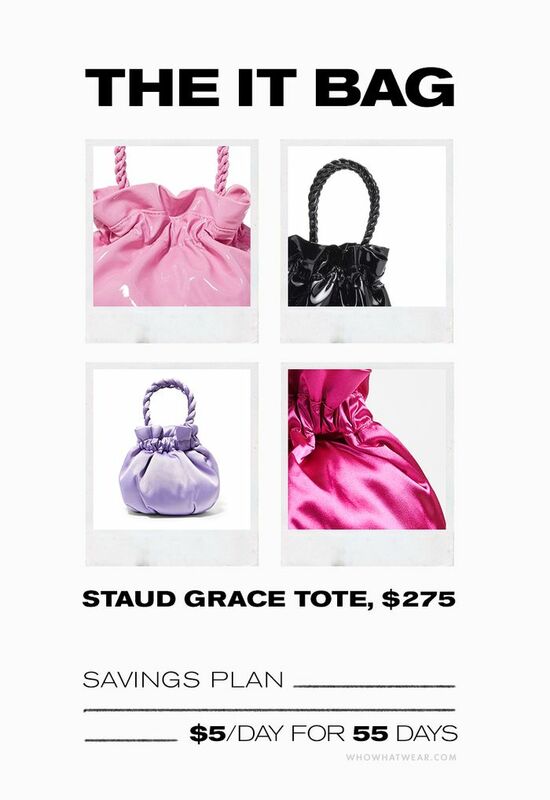 That's right—skip the Starbucks for less than two months and you, too, can tote around the little Staud baby. Keep scrolling to check out how fashion girls are wearing the Staud Grace bag, and shop every silhouette for when your 55 days are up. The velvet bag is the perfect finishing touch to this coordinating purple set. The black patent iteration gives any outfit just the right amount of cool factor. See above—wasn't lying! Just take a look at WWW editor Allyson Payer's perfect fall ensemble here. If it's slightly warmer where you are (hey, L.A. peeps! ), incorporate the bag into a denim skirt–and-tee look. Add unexpected polish to your fall ensemble by incorporating the white patent Staud bag. Further proof that this bag (no matter the color) really does go with anything—even a floral dress–and–denim jacket situation. 2things I love about this pic I look tall which is truee “not true tho” , and everything else ???? gn!???? How could you even possibly resist the pink velvet style? Just look at how it pops against the white jeans. Plaid and velvet—a match made in heaven. Next, shop cool, affordable shoes to go with all your fall outfits.